The world is filled with counterfeits. And the church is not immune, as false ideas and doctrines can infect believers and congregations. So when it comes to spiritual teachers, messages, and movements, how can we tell fact from fiction? The answers are found in 2 Peter, 2 & 3 John, and Jude, where the apostles provide practical insights for discerning truth. 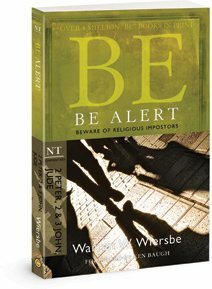 Part of Dr. Warren W. Wiersbe's best-selling "BE" commentary series, Be Alert has now been updated with study questions and a new introduction by Ken Baugh. A respected pastor and Bible teacher, Dr. Wiersbe shares how to spot spiritual errors and fallacies. You'll discover foundational principles from God's word that will help you determine the true from the false.